Hovercrafts have the distinct advantage of being just as comfortable on water as they are on land, but usually at the cost of a pretty ugly and utilitarian design. So the engineers at Mercier-Jones decided to take a crack at designing a hovercraft that was as lustworthy as a sports car, and from the looks of it they more than succeeded. 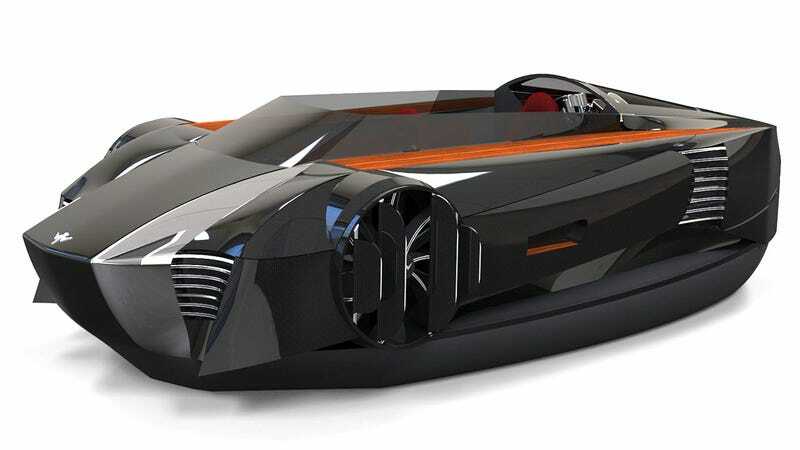 The Mercier-Jones hovercraft appears to take design cues from modern Lamborghinis, the Bugatti Veyron, and even the Audi R8. But the Frankenstein approach to its design kind of works, resulting in an amphibious vehicle that you might actually want sitting in your driveway. It's not all about looks either. Mercier-Jones claims to have designed a new directional control system that will make its hovercraft as easy to drive as a car. And with a hybrid drivetrain that uses a gas engine to power a series of electric fans, the two-seater might not actually be deafening to pilot. It's just too bad that Mercier-Jones doesn't have a definitive ETA on when the hovercraft will be available for sale, though the company's hopeful it can produce a base model with a price tag under $20,000.